Unasked questions: Who *was* buried 3 days and 3 nights? Before Jesus went up to Jerusalem to have himself proclaimed King of Israel, he prophesied that he would show off his powers by having “a son of man” brought back to life after “three days and three nights in the heart of the earth”. The magic trick might have been more credible if it hadn’t been performed by Jesus on his best friend. Luckily his best friend Lazarus was reported to have died as Jesus and the disciples were headed towards Jerusalem. Lazarus lived four miles south of the city at Bethany, with his sisters Mary and Martha. Jesus delayed his journey for a couple of days, while the disciples urged him to hurry. When Jesus got to Bethany, Mary and Martha met him near Lazarus’ tomb and made a theatrical production of grief. Jesus dramatically called for the stone to be rolled away and called Lazarus to come out, even though he was four days dead. Lazarus came out. “Therefore many of the Jews who had come to visit Mary, and had seen what Jesus did, put their faith in him.” (John 11:45) The wording suggests that many others were unimpressed with the show, and didn’t believe it. So the “three days and three nights” prophecy was fulfilled even before Jesus rode into Jerusalem with the crowd calling him King and God’s Anointed. He had no reason to think he himself was going to be the object of the prophecy. Lazarus fulfills Jesus’ prophecy. 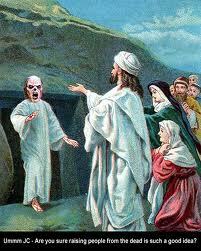 Which is more than can be said for Jesus, who was only buried for some 36 hours before his corpse disappeared.